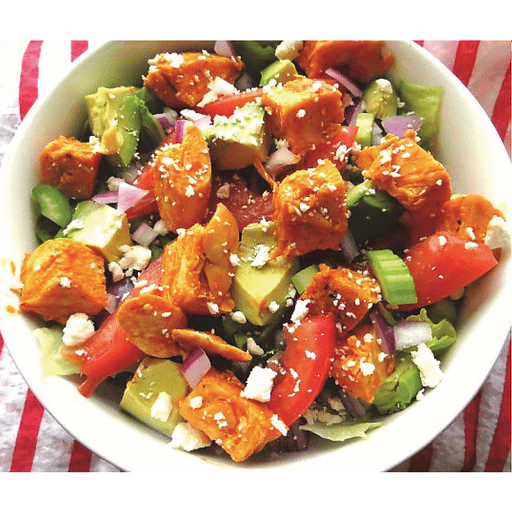 This inspired Buffalo Chicken Salad takes top prize since it is anything but bland! Loaded with bold flavors ranging from hot buffalo sauce to tangy feta cheese, less is more with these toppings. 1. Lightly season both sides of chicken breast with salt and pepper. Cook chicken in nonstick skillet, over medium high heat. Once chicken is cooked through, remove from pan and let rest until slightly cooled, about 5 minutes. Cut into even-sized pieces and stir in buffalo sauce until chicken is well coated. Set aside. 1. Add 2 cups lettuce to 4 separate bowls. Layer with celery, tomato, cucumber, red onion and avocado. Add buffalo chicken and sprinkle with feta cheese. Serve immediately or chilled. Calories 300, Total Fat 15g (Saturated 4.5g, Trans 0g), Cholesterol 100mg, Sodium 530mg, Total Carbohydrate 12g (Dietary Fiber 6g, Sugars 5g, Includes 0g Added Sugars), Protein 31g, Vitamin D 0%, Calcium 10%, Iron 10%, Potassium 20% *Nutritional values are an approximation. Actual nutritional values may vary due to preparation techniques, variations related to suppliers, regional and seasonal differences, or rounding.